Stopped in Rome for a couple of days on my way to India with one purpose in mind — to see the exhibit at the State Archives on Caravaggio in Roma. Caravaggio was the original bad boy of the baroque. In and out of trouble with the police, carrying a sword without a permit and yet the most sought after painter in Rome in his time. That is until he killed a rival in a dual in 1605. Today I saw the original documents of his many arrests, his rental contract with his landlady (which documented him removing half the ceiling to make room for his paintings), a painting he did of Il Papa (the Borghese pope of the day) which has not been shown for 100 years because it is in the Borghese private collection – and the most important to me – the piece of parchment documenting his commission to paint the two paintings in Santa Maria del Popolo. 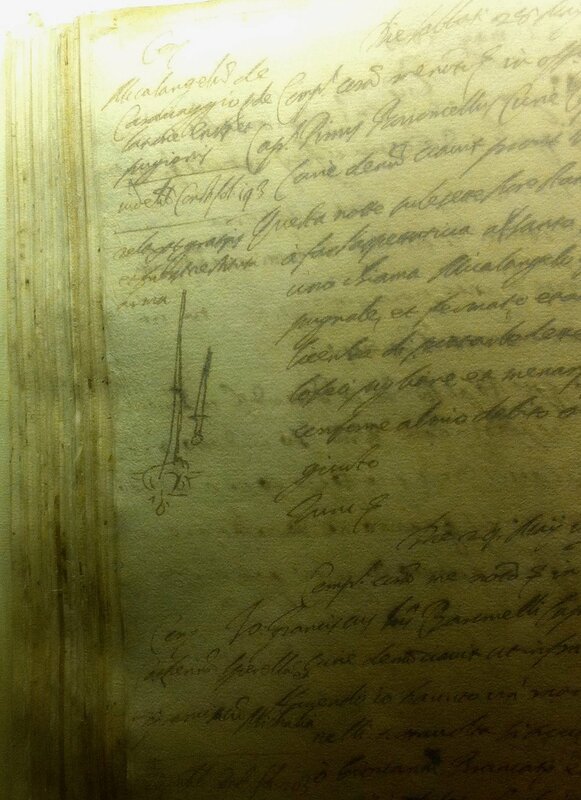 And the contract for the St Matthew paintings in Santa Luigi Dei Francesi. Nose down, maybe 3 inches from the documents, I could not believe I was seeing them. I was dizzy with the intensity of my feelings. Caravaggio was a common man. He made the sacred profane. He painted religious subjects as ordinary people. And one of the most shocking aspects of his paintings at the time was that he painted bare, dirty feet (one of his paintings was rejected because of the bare feet!). Now if you have spent any time in Rome at all you know your feet get grey with grime. In the Crucifixion of St Peter the saint’s feet are a gentle grey as they crucify him upside down, but the man who is on his knees pushing up the inverted cross (on the left) – his feet are black with dirt. As shocking are the feet of the pilgrim in the Madonna of Loreto in the Basilica di Sant’Agostino (on the right here). These are paintings that make your heart stop beating in your chest and I stand in front of them for unseemly periods of time, drinking in every detail. But today was not only in the 15th/16th century. I got my feet plenty dirty walking miles and miles. It was that or fall asleep since I landed mid morning. And for the first time today I saw Ara Pacis. Not on the beaten path for most tourists but between Ara Pacis, the now abandoned Augustus mausoleum and the Pantheon – which 2000 years ago bordered a large “field” (which is now densely packed with 16th century housing) between these three you can catch a glimpse in your minds eye of how dramatic and ceremonial the northern, recreational part of Rome was. I wandered back along Via Corso, looking at the shops and crowds, but in reality I was walking down Via Flaminia laid down 2,200 years ago.